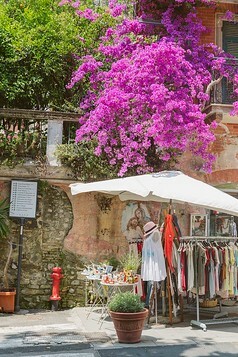 A popular way to enjoy Cinque Terre is to hike the walking path connecting each of the five towns. The most popular trail is #2 (the Sentiero Azzurro, or ‘Blue Trail’) which is composed of 4 individuals paths that follow the coast. Today I’m sharing some tips for hiking in one of Italy’s most popular destinations! Only 2 of the 4 trails are open; the other 2 are closed due to storm damage. The blue trail is not the only trail, just the most popular and in peak season gets quite crowded. There are other trails above the villages that should be less trafficked, but they are away from the water, hotter and also considerably steeper. In fact, Rick Steves recommends hiking it up to each village’s local church and cemetery but I have to admit I just was not feeling that steep a climb in the heat. For those in shape, you can walk the entire route in about six hours. But, most people prefer to spread the route out over a couple days so they can stop and enjoy the towns. 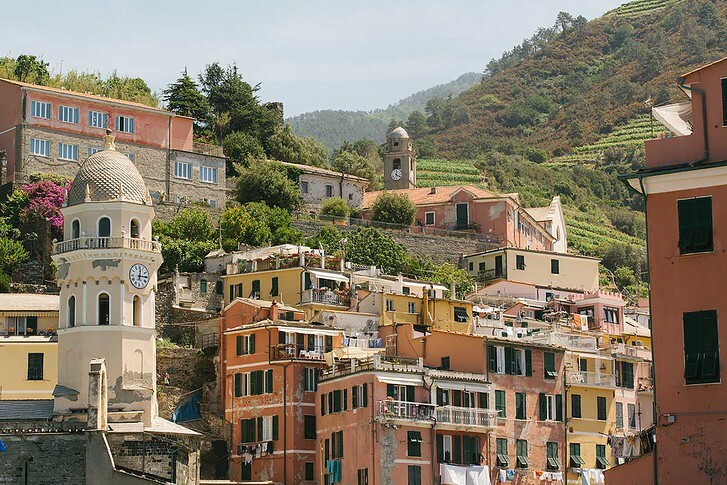 If you know that you’ll be in town for a couple days and want to hop between towns, consider one of these Cinque Terre cards to save money. A Cinque Terre Treno Multi-Service Card includes all the hiking and shuttles above plus the trains. 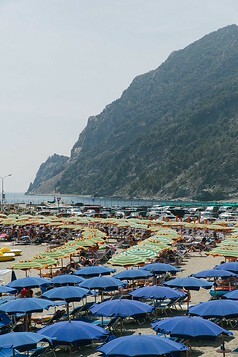 It includes the local train line which connects each Cinque Terre town as well as Levanto and La Spezia. Costs €16 for 1 day or €29 for 2 days. Make sure to validate tickets in the green machines before boarding. If you’re an early morning hiker, before 8am, I did notice that the check points were not yet open on trails. Trails can get quite crowded in peak summer tourist season so I recommend starting as early as possible. 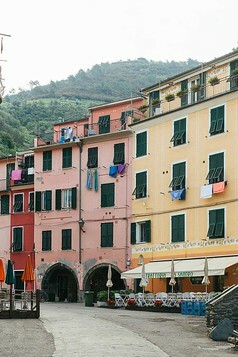 You can also purchase a combo Cinque Terre Card and Guided tour here which includes transportation. Which Way Should You Hike? This is totally a matter of personal preference and where you’re lodging. 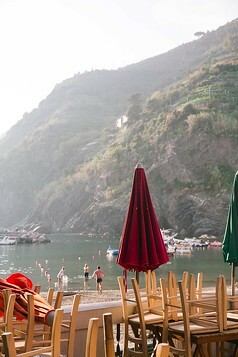 You can hike Cinque Terre from either direction (Monterosso heading south, or Riomaggiore heading north). 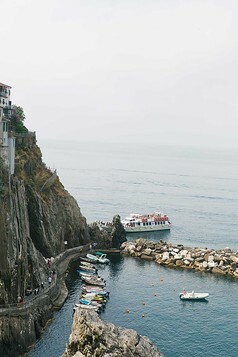 The southern most route, from Riomaggiore to Manorola, is known as Lover’s Lane as village girls and boys from the two towns used to sneak away to meet on that path (make sure you spot the kissing statue and tunnel carved with love messages). This section of the #2 trail is wide, flat and paved and therefore the easiest, so if you’re an unsure hiker you may want to start here. (As of 2018, this trail is unfortunately closed due to a mudslide). For something even more adventurous, consider paragliding over Cinque Terre for epic views! More details here. I Hate Hiking… Which Trail Is An Absolute Must? If you only want to hike one trail for the experience, I’d recommend the blue trail between Monterosso and Vernazza. This is the hardest hike, with lots of stairs and narrow passages, but is the most rewarding! The complete hike takes around 2 hours and includes a panoramic view of all 5 towns. 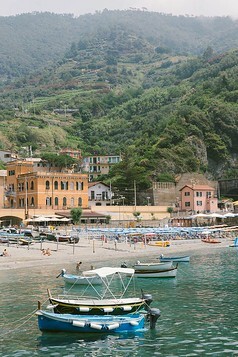 Also don’t skip the walking path to the left of Monterosso’s harbor (if your back is to the water). This is a flat loop around the town’s newer park and cemetery with some very pretty views! I just want a photo…do I need to hike? 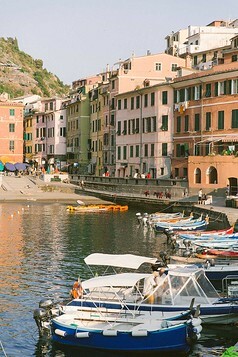 Stay in Vernazza and head towards the train station. Find the stairs leading upward and climb, climb climb for ~10 minutes. You’ll find a beautiful shot overlooking the back of the town jutting out to the sea. Want one more beautiful shot? 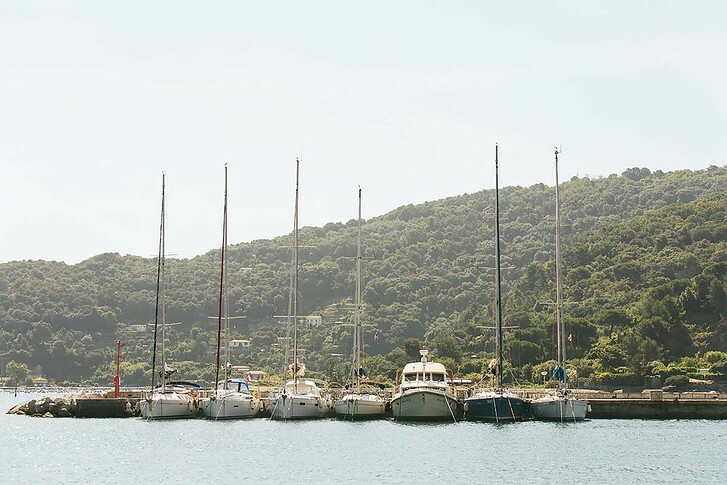 Again, starting from Vernazza this time head towards Monterosso. You can find the exact spot where to start for either of these options in Rick Steves Italy guidebook. He has an excellent map of the trails. About 10 minutes of light walking in the direction of Monterosso, stop and turn around for an incredible view of Vernazza from the sea. You’ll see the harbor, the clock tower and all the pretty boats at dock. 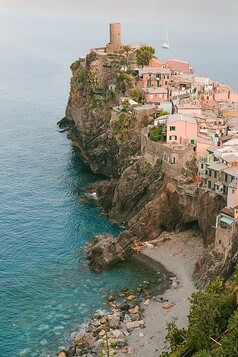 That way, you can have a small taste of what hiking in Cinque Terre is like without committing to an hours’ long trek. You can see how my shots of these 2 viewpoints turned out in my photo diary post here. 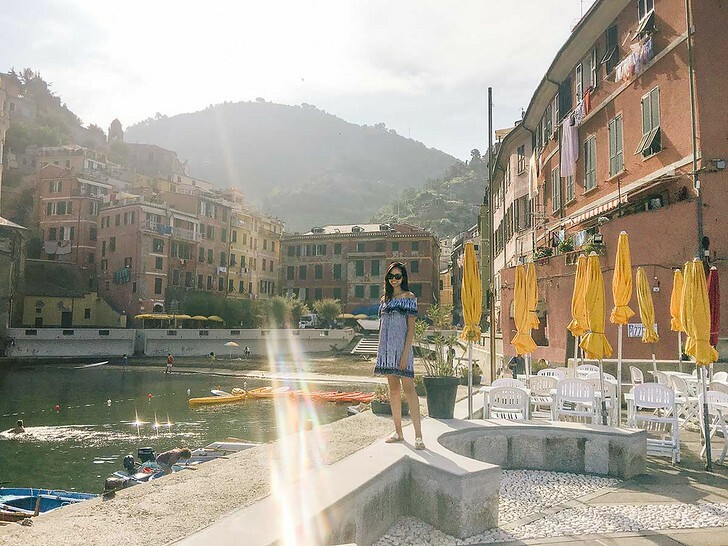 One of the most picturesque hikes is the route connecting Vernazza and Monterosso so if you love to hike, either of these towns would make a convenient base. If you stay in La Spezia or another larger town that’s not in the Cinque Terre, you will have to factor in at minimum, 1 hour additional on the train. 1. Santa Marta in Vernazza is an affordable lodging pick with recently renovated rooms and air conditioning (a rarity in Cinque Terre!). 2. 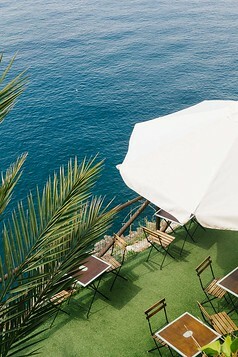 Hotel Palme is a lush, secluded property on Monterosso’s hill with beautiful view and within a short walk of the beach. Rooms are clean and light filled, some with balconies. Are you a hiker? 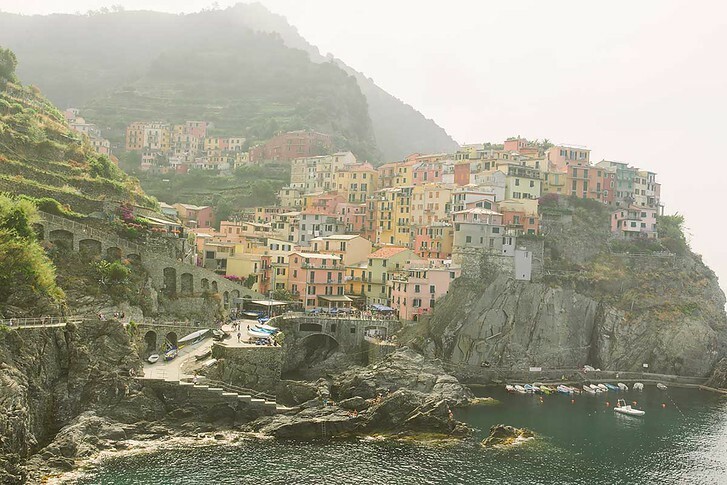 Let me know in the comments which your favorite Cinque Terre hike was! Great post! 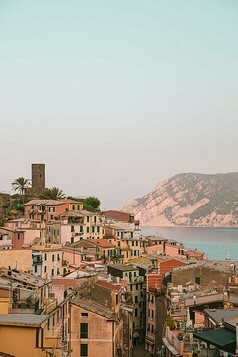 I remember hiking in Manarola. Beautiful views, but I was so out of shaped I gave up and turned around :( I wish I would have done more hiking in Cinque Terre it was so amazing. I feel ya! It was definitely a tougher hike than I expected! We visited Cinque Terre for our Honeymoon last year and did the what the locals call “the crazy hike” which is basically up and over, due to the paths being closed. the views were absolutely incredible. It took us 6 hours and had to sacrifice a pair of shoes but I would do it all again!